Soap Concentrate that Cleans Everything, Kills Bugs! EDIT: A commenter asked what the ingredients in Shaklee Basic H2 are, and lo and behold, they’re not on the bottle! I really dislike companies who won’t disclose. I went looking online for the ingredients and discovered that they’re pretty hard to find. This site listed them supposedly from the MSDS and had some concerns, although if you read all the comments they may not be warranted for one reason or another. I do actually agree with that author that companies who care about being “green” should always disclose, no matter what. I am a huge fan of anything that can save, time, money or space. I like doing two things at once or repurposing items that are often thrown away, and I especially love things that I can use for more than one purpose. 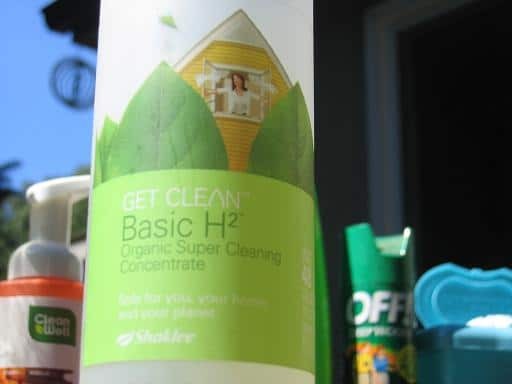 Shaklee Basic H2 is totally biodegradable and safe for the environment, which is super important while camping, and it’s safe for my family’s skin. I made up a fresh batch of wipes for the trip, not just for diaper changes but for wiping hands and faces and grills and tables. (Related: how to make homemade wipes.) I try to create as little waste as possible, even while out of my home, so I did use a washcloth as often as possible to wash tables and faces, but sometimes conserving water is most important when you have to haul in your own. (We didn’t even go through the whole box.) I like that H2 is concentrated, so I don’t need to use very much and I don’t have to throw away or recycle many bottles. Now I’m not affiliated in any way with Shaklee. I don’t sell it, and I don’t even use any of their products other than this one (I just use vinegar and baking soda for most of my cleaning). I’m a big fan of the Basic H though. If you go looking for it, try to find an independent distributor in your area to purchase from. It’s important to support families and stay-at-home-moms who are trying to earn income this way. Here’s my friend’s site if you don’t have your own distributor. 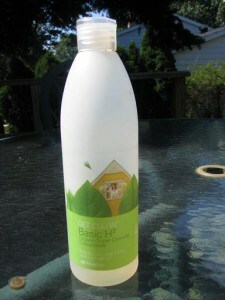 A bottle of Basic H2 costs around $12 or so, which sounds expensive until I tell you that I’ve had my bottle for over two years, and it’s made dozens of refills of foaming soap, countless containers of wipes, come camping and protected our family from pesky mosquitoes through three summers. That’s a bang for your buck! Find other great real food and natural living CAMPING posts from me! What a great, versatile product! Jill, I wonder, too! Amway (it has a different name now which is escaping me) is just down the road here. Is it a natural product? You had me at “bug repellent”! I’ve been frantically searching for something that isn’t terribly expensive, that won’t necessarily end up wasted if we don’t care for it, that the cure isn’t worse than the disease so to speak. I’m off to look for a local distributor . . . thanks!!! I want to find a shaklee dealer! This sounds great! PS – included this on my weekly roundup. Link is under my name. Thanks! We had a Shaklee rep come and talk to my mom’s group and I loved this stuff but didn’t buy it. I might need to find her again. Been looking for something like this for my son’s first Cub Scout camping trip next month. Thanks for posting. .-= Lisa´s last blog ..Menu Plan Monday =-. hey, full disclosure: I DO sell this stuff, but it is amazing and chemical free (my huband and I went chem-free on all our skin and hair and cleaning supplies a little over a year ago). Young Living’s Thieves products: household cleaner (concentrate that can be made into a number of products), toothpaste, mouthwash, hand sanitizer, essential oil, throat lozenges, floss, and more. It’s called Thieves because it’s made from an essential oil recipe that was discovered by the thieves of the plague times. They used a combination of anti-viral oils to rob the dead and dying plague victims without getting infected. When they were caught, they were given the ultimatum: tell the recipe or be put to death. Honestly, for me, therapeutic grade essential oils (different from what you buy in the local health food store) are truly ‘God’s love made manifest’ for us to heal with. .-= Jessica Waters´s last blog ..foodiegrrl: @ApothecaryJeri YOU TOTALLY ROCK, girlfriend!!! =-. I have been using Basic H for over 30 years now. It is the only soap I take camping, because it is bio-degradable. At home I use a small amount in warm water to clean my wood floors and windows. I have also used it for hand washing clothes. When my children move out they get a bottle of Basic H. By the way, I love this web site. Just discovered it today. Do you have a resource for how to dilute it for everything? 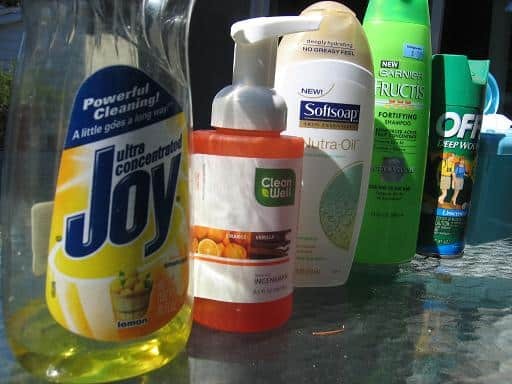 I’m going on a mission trip to the Philippines next summer and it would be EXCELLENT to have ONE BOTTLE for shampoo/body wash/bugspray/hand soap/shaving cream/laundry detergent…I even read you could soak your contacts in it. HELLO!!!! what are the ingredients in basic h2?